I love this simple headband. I've made tons of them and have been making them for months. Only, I've never written the pattern down until now. I've kept the original specs on a tiny handwritten note in the cubby next to my big comfy work chair. It's a wonderful beginner pattern, and is very easy to work. For the experienced crocheter, it can be worked in as little as a half an hour. I've included instructions for making in three sizes: adult, child and toddler. This pattern is so versatile, it can be made in so many different ways. No matter how you choose to construct this headband, it'll turn out adorable every time- guaranteed! It's wide enough to be an ear warmer and is a very popular in-demand winter weather accessory. You can make it more narrow to be a warm weather sweet headband.You can make it to fit any person, and make it as wide or as narrow as you like. Change colors for a striping effect, work in solids, metallics or variegated for a bounty of beautiful easy to make, quick to work headbands. Makes a great gift. Make them in team colors, or make enough for the whole team! I did them in black and orange last year and all my daughter's little cheerleader friends looked so cute sporting them. I also paired this headband with my Quick Mitts fingerless mittens in matching colors and gave them as gifts this past Christmas. They were a massive hit- everyone loves getting matching sets of accessories! This headband, like some of my other patterns includes the foundation half double crochet (FHDC). If you don't know how to foundation crochet, I highly suggest you visit YouTube, and look up some instructional videos. I have also included written instructions for the stitch with my Easy Fishnet Gloves pattern. It's a very valuable skill to learn because sometimes chaining, and working into a starting chain can create a tightened effect, making the foundation row not as stretchy and wearable as the rest of the garment. To make every row equally stretchable and comfortable to wear, chainless foundation crochet is the way to go! If you're not quite there yet, have no fear, even a novice crocheter can make this pattern. Simply Chain the appropriate number according to the size you wish to make, join, and work into the starting chain for round 1. Just be sure to chain on the looser side if you are a tight tension worker. Please feel free to sell any items you make from my patterns, but you must credit me with the original design and include my brand name and website on any product tag, additionally do not use my photographs to sell your items! Thanks for respecting the craft! Note: To make band wider for ear warmers, make more than 8 rows. To make a summer headband, make fewer rows. When making for child/toddler- 5 rows is usually wide enough. 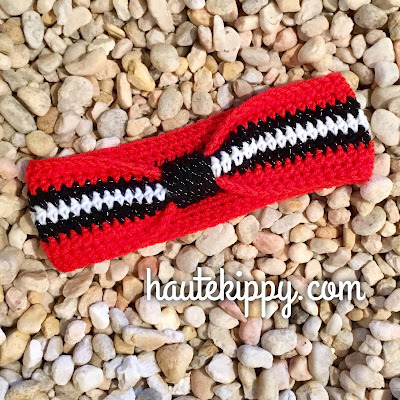 Feel free to get creative when making your own headbands, they can be as wide or as narrow as you want. Round 1: FHDC 63, join to top of first fhdc with a sl st.
Rounds 3-8: Repeat round 1. FO at end of round 8. Finishing: Use the starting tail to close the small gap at the first join and attach the bottom ends of the foundation row together. 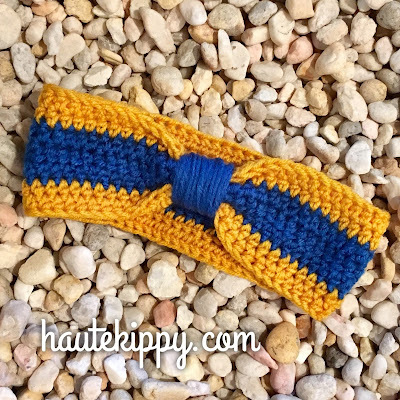 Then take the starting and ending tails, and tie them together over top of the right side of the headband, trim ends. 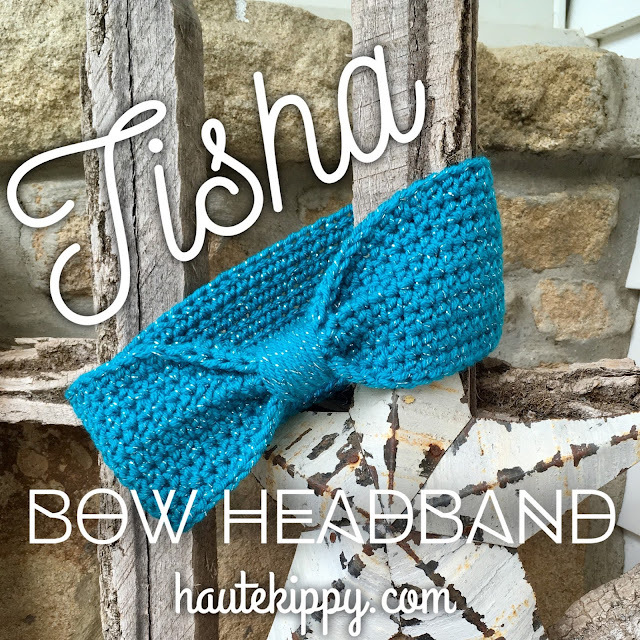 Take extra yarn and wrap around tied/joined section of headband repeatedly to form a bow's "knot". Wrap to apx. 1" wide to hide the seam. Break yarn, and thread tail with a yarn needle. Turn headband to wrong side and secure end of wrapping yarn by sewing back and forth under the "knot" and through headband, taking care stitches do not bleed through to right side. Sew back and forth several times to permanently secure it in place. Cut yarn close to "knot". Share your work with me! #hautekippy on Instagram or connect with me on Facebook! Find me on Ravelry and Pinterest too! If you feel led to express your gratitude for this and my other free patters, you can contribute a thank you gift of $1.00 or any amount safely and securely with PayPal by visiting paypal.me/HauteKippy. 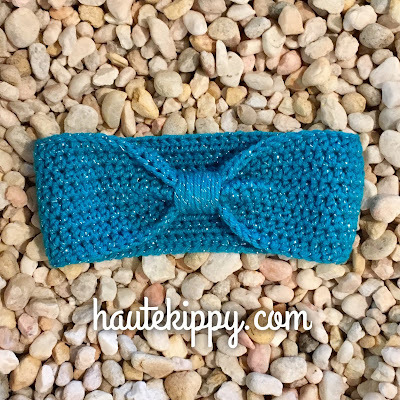 Your generosity helps support more free patterns and content on Haute Kippy! Thanks and God Bless!